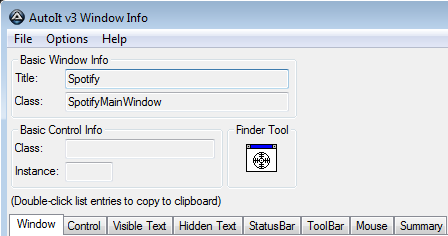 The WinActive function checks if a window is currently active. The AutoIt WinActive function is used to check if a window is currently active. If are looking for a way to activate a window, look up WinActivate instead. Checking if a window is active can be useful to avoid bogus clicks and key sends. Before input is send you would usually make sure, that the right application window is active. Use this function in combination with conditional checks, to make your script do whatever you want, depending on the response from WinActive. And checking by window title. The following is not the best example, since the title text of the window in Spotify, includes the title of the song you are currently playing, making it unreliable – but it clearly shows the point.